You have chosen an honorable profession with an illustrious past and an exciting future. 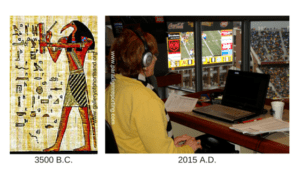 Beginning in approximately 3500 B.C., when Sumerians began capturing the spoken word in Mesopotamia [now Iraq], scribes have fulfilled the essential role of preserving the record at important events throughout history. With the rapid advancement of technology in the past century, today’s global “scribes” are highly trained, tech-savvy guardians of the record who are able to stream realtime at a law firm, courtroom and over the web to attorneys in remote locations. Broadcast captioners or CART reporters provide instant visual displays of the spoken word at seminars, conferences, university classes, news, sports, and other events for individuals who are deaf or hard of hearing. Imagine captioning Superbowl games; capturing the record in Congress, reporting depositions of celebrities like Elon Musk or working on complex litigation cases abroad! Still, there are many hurdles to overcome on the path to becoming a Certified Shorthand Reporter, Registered Professional Reporter, CART reporter or broadcast captioner. The biggest challenge is getting through school, where court reporting students spend an average of five years, with an uncertain graduation date. If you have been in school for a while and are wondering . . .
Will I Ever Finish Court Reporting School?
. . . you are not alone! Most students ask themselves the same question, especially when they are stuck on a plateau or after failing yet another exam. Students who attend online programs may stay in school longer without the face-to-face support of teachers and fellow students. You are not crazy. Court reporting school IS very hard! You may not be able to grasp this right now, but later you will look back and appreciate how every challenge you overcame in school helped you develop the strength, courage and knowledge you needed to succeed. Court reporting school is akin to a military boot camp. It provides the disciplined “basic training” you need to prepare you for the real-life unpredictable challenges and demands court reporters face every day. In school, you learn how to master your body, mind and emotions. Mastering the steno language and your writer requires intense diligence, focus and repetition. Through diligent, focused, repetitive practice, you develop the physical, mental and emotional fortitude and stamina you will need as a working reporter. Court reporting teaches you how to master your feelings, quiet any distractive thoughts, and control your body’s responses in order to be fully present in the moment to capture every word, no matter what is happening in the room or how you feel about it. It requires tremendous self‑control, self-discipline and self‑awareness, while simultaneously being outer-focused. Beyond the mechanics of reporting and writing words, there is something even more profound taking place. The art and power of THE REPORTER is having the ability to detach from the emotion, energy, posturing, politics, drama and agenda of participants while simultaneously detaching from your own internal responses to all of that intensity. The act of capturing the record calmly, without attachment to what is going on in the room, the cause of action, parties or outcome, is a sacred experience. As the neutral guardian of the record, you are, in essence, an impartial sacred witness to truth being revealed. Register for my 5 Golden Rules to Steno Mastery course HERE. The above is an excerpt from the Introduction to my e-book, 0-225: Your Guide to Writing Mastery, published October 2015. All Rights Reserved. This excerpt (and e-book) contain intellectual property owned by Ana Fatima Costa and AFC Consulting Services, including trademarks, copyrights, proprietary information, and other intellectual property. No part of this publication may be reproduced, stored in a retrieval system or transmitted in any form or by any means (electronic, mechanical, photocopy, digital, recording, scanning or otherwise), except as permitted under §107 and 108 of the 1976 United States Copyright Act, without the prior written permission of the author. You may download and view a digital copy of this e-book for your own personal reading. Otherwise, you may not modify, publish, transmit, participate in the transfer or sale of, create derivative works from, distribute, display, reproduce or perform, or in any way exploit in any format whatsoever any of this e-book’s content or intellectual property, in whole or in part, at any time.